We’re delighted to be able to present Annie Dearman and Steve Harrison at this year’s Frittenden Old Fashioned Night Out. We don’t see them very often in this corner of the country, but they’re a high class act, and Annie’s terrific voice and considered way of working with a song are sure to impress anyone who sees them perform. Singer Annie and Steve (melodeon, mouthorgan, anglo-concertina) perform traditional songs in a robust and firmly-rooted English style. They take their songs from traditional singers, the folk song collectors of the late nineteenth and early twentieth century, manuscript books of past performers of traditional music, printed ballad sheets, and songs and tunes they happen to hear and like. Annie is our Essex representative. She sang with several Essex-based a cappella groups in the 1970s and 1980s, and after moving to Yorkshire in 1990 she was a founder member of the voice workshop Making Waves, before teaming up in a duo with Vic Gammon in 1993. 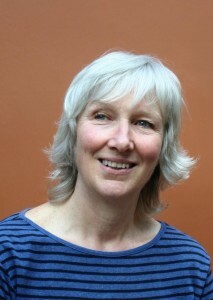 She wrote, directed and sang in the show The Weavers’ March (starring Pete Coe, Chris Coe and Vic), which was commissioned by the 1998 Ilkley Literature Festival. Away from music, she is a freelance designer and maker of theatre costumes, backdrops and banners, and has recently completed several seasons’ work for the well known Mikron Theatre Company. Annie also designed and made the costumes for the Long Company mummers, who appear on the cover of Pete’s CD also titled Long Company. Steve has lived in Yorkshire all his life. He played mouth organ, pipe and tabor, bagpipes, whistle and saxophone for the ceilidh bands Official Brawl and The Herb Boys, and has been musician for several morris and sword dance teams. 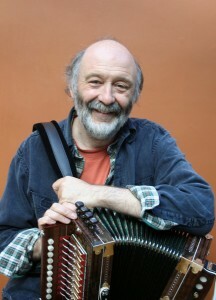 He is a member of the Long Company mummers and currently leads the traditional English dance band The Black Box Band with Chris Coe, Alice Jones and Sue Coe. Away from music, he is a social scientist at the University of Manchester. Annie & Steve are residents at the Ryburn 3-Step Folk Club in Ripponden, and with Vic, are Dearman, Gammon & Harrison, whose highly recommended CD Black Crow/White Crow was released not to long ago by the English Folk Dance & Song Society (EFDSS CD11). Rosie Davis was born in Woolton near Liverpool, and has been singing and dancing from the age of three years. She became interested in folk music in her teens and developed an interest in Old Time Music and Bluegrass, playing and singing at home with her two older brothers. Rosie has been instrumental in the development of freestyle Appalachian step-dancing in the UK from the early 1980s, performing and giving workshops at many high profile festivals here and in Europe. As a respected musician, as well as an entertainer, her love and understanding of traditional music underpins the way she teaches and dances. Most recently she has been developing her interests in Southern English step dancing and European social dance, and singing for dancing. Rosie plays with string band Old Faded Glory in East Sussex as well as performing solo at folk clubs, with Dave Arthur and Pete Cooper in Dance-tales, with Sisters Unlimited and Jig Jaw. She has been a member of several celebrated Bluegrass bands and plays autoharp, banjo, bass and feet – not all at the same time and is much demand as a dance caller. Rosie’s instruction book and music for dancing, Karaoke Cloggin’, is available on CD. We’re also delighted to have her as one of the organisers of the Frittenden Festival – Sing, dance and play.